You could call it the art of romancing the tavern culture while trashing it. “Regulars Need New Barstools” says the headline in that odd obituary in the Portland Tribune (2/2/07). That means move on now, Virginia-Cafe folks. Your bar will be demolished. This skyscraper, Moyer Tower, is a done deal. No discussion, please. Moyer Tower, 35 stories, surprise! Who would have thought that one developer, who already had such a gigantic footprint upon this sensitive little city, would venture another midtown high-rise big-box? What hubris! If you behaved that aggressively in a tavern, you’d get 86’d. What’s the big need? Must be that Moyer’s got that New York fever. To the Virginia Cafe people, the developers say through their paper, move on to “new barstools.” But where? The tavern culture of downtown is rapidly disappearing. No answer is forthcoming from the Tribune on where these new stools might be found. In recent issues one can also find colorful reflections on the Brasserie (closed), Hung Far Low (closed), Silverado (soon to close). Who’s next, River City? The Cement-Mixer’s barroom nostalgia pieces favor a dash of decadence and scandal. A gangster past is gold. The writing is designed to titillate the sensibilities of some hypothetical up-scale condo buyer who would never set foot in such a place. 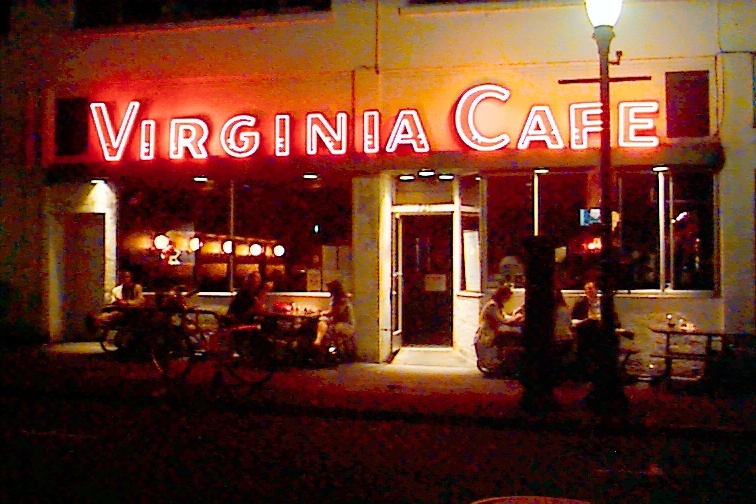 “Dark and smoky” is that degenerate old “relic,” the Virginia Cafe, and that means it’s OK to destroy it. Patrons, too, are characterized as relics. (The Tribune recently moved to the suburbs and is so out of touch with downtown it’s still devoting many columns to demonizing the homeless, long ago effectively driven out, sometimes at gunpoint.) The puritanical Tribune is an affiliate of a huge Christian publishing biz financed by a local cement mogul. The Cement-Mixer Tribune, as we shall call it, characterizes Virginia regulars (some by name) as alcohol addicts wandering the downtown streets compulsively searching for that new bar stool. (How insulting! Is there a lawyer in the house?) And the Cement Mixer could not resist once more resurrecting the scandal of that deposed development czar, Neal Goldschmidt, whose girlfriend talked too much at the Virginia and who had his own plan to trash the same block to make a park. The tavern scene is at the very heart of Portland’s urban culture and is a magnet to the coveted tourist. But, like some other valuable local cultures, the tavern culture is being systematically destroyed, and in the name of “invigorating” the city. This is being done by planners so frightened and uptight they cannot trust the public in taverns or in any public convening, including the government forums in which this kind of high-impact proposal is customarily debated or appealed. Do they fear rejection? Maybe a few drinks would help.